There’s a getting your kids in a school year routine works. There’s also a reason when you drop the ball on your routine things go haywire. Setting up a school year routine is just as important for going back to college as it is for your kids going back to school, especially if it has been years – or even decades – since you set foot in a classroom. When building a routine for academic success, start big and then work your way down to your day-to-day routine. Think of it as circles held within circles. A routine exists within a larger framework, and your larger framework is your school of choice. This is your outermost circle. Make sure to find the right fit for you. That means your school is affordable for your budget, accessible in terms of hours and transportation, and has options and assistance for your particular learning style. From there, move a step inward and build a degree map. This is a detailed list of all of the courses you will need to complete to finish your degree within your desired timeframe. Make this list thorough and be honest with yourself about your timeframe. How many courses can you REALLY handle at once with your schedule? Maybe one semester you can take a full course load and then take the next semester part time. Talk with your family about what would work best, and talk with advisors when devising this degree map. Once you have it, honor it. Once you have your degree map and course schedule worked out, make a daily or weekly schedule for yourself. Be sure to allocate study time as well as social time and downtime. Beware of overbooking because it will just lead to exhaustion and frustration. At the same time, while it may be tempting to burry yourself in the books, an important part of going back to school is making connections. When you’re struggling, need help motivating, or having trouble getting out of bed to go to school, it’s the people you are going through it with who make all the difference. It’s your teachers and classmates who keep you going when your motivation gives out. Now that you have your back to school routine built, take time at the end of each semester – or at midterm – to assess and adjust as needed. Be sure to also take time to celebrate your successes and accomplishments instead of just diving into the next round. Does your degree map not fit your desired timeframe or budget constraints? Sometimes life gets in the way and foils your plans. Don’t let the course credits that you have already earned go to waste! 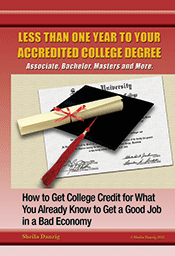 In fact, combined with your years in the workforce, you may have already earned the degree you are working towards. For a free consultation, visit us at thecareerpeople.com.